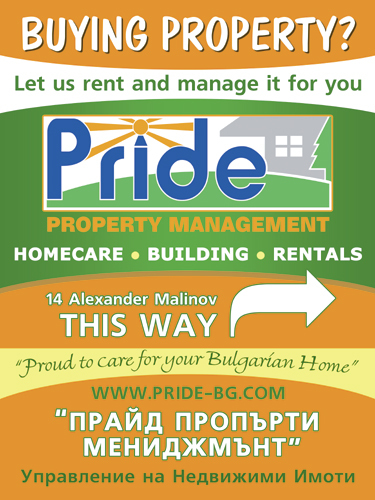 Communal Area Management and maintenance in Bulgaria. Property Developers services. When developing property in Bulgaria, you will be aware of the importance potential buyers place on proper management and maintenance of the communal facilities. If you are a property developer building apartment or villa complexes in Bulgaria we want to hear from you! Astute buyers demand protection and growth prospects for their investment, which are assured by a partnership with Pride Property Services. This means contracting a reliable partner for the management and maintenance of communal areas and facilities, who can also offer your customers the best possible chance of maximizing their rental earnings. We will review the layout, configuration and facilities you are planning for your development and will give you a formal written offer for the management of the complex according to your requirements. We may also suggest various additions or changes in order to take full advantage of the future rental potential. Our communal maintenance service can include providing 24 hour security, reception and bar services, cleaning of communal and private facilities, lifeguard and pool cleaning duties, gardening services and more. We will also extend our services to any owners who require a complete property management package for their villa or apartment, to ensure that everything is always in good, clean order and that their bills and other worries are all taken care of. Communal maintenance contracts in Bulgaria work best when we enter into a partnership with developers at a pre-sales stage as it is very important to have the agreement of all the owners at the complex to subscribe to the service. This way we can provide you with all the necessary contract documentation to be signed with preliminary contracts, and this avoids difficult situations in the future when only some of the owners are committed to caring for their communities' facilities. Agreeing a strategy for the ongoing care of your building and customers is the best way to guarantee excellent occupancy rates and rental returns for your buyers, and will therefore add essential value to your sales proposition and ongoing business venture.